On February 3, 1949, a crowd of over 25,000 gathered at New York Harbor to see the arrival of a merchant ship named Magellan. On the side of the French freighter were painted the words 'Merci America'. Aboard were forty-nine French railroad box cars filled with tens of thousands of gifts donated by French citizens. 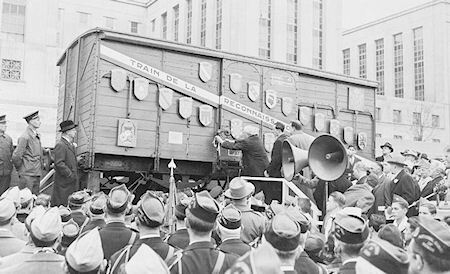 This was the Merci Train, a token of appreciation to the people of the US from the people of France, for the 700 boxcars of food and relief materials that Americans had sent to war-torn Europe in 1947.